Mysa is a Smart Thermostat that functions with high-voltage heating solutions, such as baseboard and fan-forced heating. These types of home-heating are the ones primarily found in Newfoundland and Labrador. Mysa stands alone in the crowd, as most other automated heating solutions can’t work with high-voltage heating systems. Mysa thermostats are one-of-a-kind, because they use artificial intelligence and an app on your devices, that promises a more energy efficient home. The Mysa automated system learns the habits and behaviours of the home-owners and is able to heat the home accordingly. The app available for both Android and IOS can perform such tasks, as changing your temperature remotely, determining your location ( to heat your home appropriately), a vacation mode and in-depth reporting to see how much you’re saving and ways where you can save more! 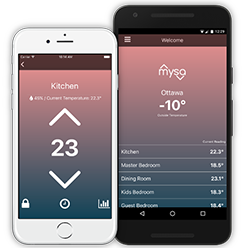 The big thing that Mysa does is it’s a smart thermostat that works with high-voltage heating systems, that’s one in 10 homes in the U.S. and one in three homes in Canada. Earlier this month Empowered Homes received $600,000 in equity which will come in handy when developing and shipping their first batch or orders. The financing is a deal by two St. John’s based funding agencies, Venture NL, whom is backed by the Government of Newfoundland and Labrador. The other is Killick Capital. In the last few years they have invested in at least five other start-up companies, who are achieving greatness. BetaKit, a Canadian start-up news company also posted an article on this, found here. Empowered Homes is currently working on the business development and exploring opportunities with retailers, quickly changing from a marketing outlook to a sales strategy. Pre-order sales have been outstanding for Mysa, with a promise to be delivered by late October of this year. To learn more about Mysa and get your pre-order, click Here!